We’re giving away a Superior Garden Tools Set with Trowel this month. Simply fill out a brief form to enter. With these polished stainless steel 3 piece premium garden tools set you'll get the best gardening tools that every gardener needs. Specially designed to meet the needs of any avid gardener looking for an exceptional set of garden tools, or beginner gardener that is looking for the right garden tools to start the garden of their dreams. TROWEL designed to maximize leverage on tough soil. CULTIVATOR with sharp tines for tough soil. Gardening guide "10 Steps to Starting Perfect Garden"
Each gardening tool is crafted to give you more leverage and strength while digging into soil while reducing hand and wrist strain to make gardening easier and more enjoyable than ever. * Your phone number and email address will not be displayed, it will only be used to contact the winner(s). PRELIMINARY INFORMATION: NO PURCHASE NECESSARY. A purchase will not improve your chances of winning. Void where prohibited. 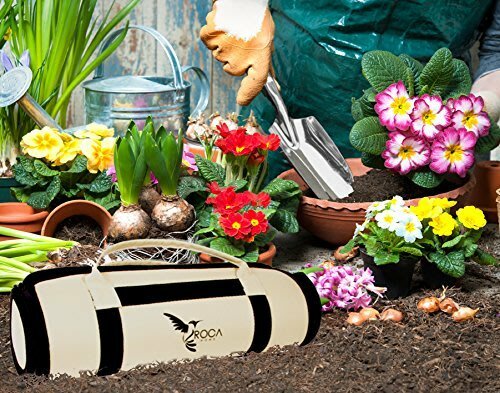 The ROCA Garden Tool Set Sweepstakes (“Sweepstakes”) will begin on May 17, 2017 at 12:00 A.M. ET and end on May 31, 2017 at 11:59 P.M. ET (“Sweepstakes Period”). All times in the Sweepstakes refer to Eastern Time (“ET”). Odds of winning depend upon the number of eligible Entries (as defined below) received. Sweepstakes is subject to all applicable federal, state and local laws. ELIGIBILITY: Open only to permanent, legal United States (“U.S.”) residents who are physically residing in one (1) of the forty-eight (48) continental United States or the District of Columbia (excluding Alaska, Hawaii, Puerto Rico, Guam, the Virgin Islands and other United States territories), and who are eighteen (18) years of age or older as of the start of the Sweepstakes Period. Officers, directors, and employees of Sweepstakes Entities (as defined below), members of these persons’ immediate families (spouses and/or parents, children, and siblings, and each of their respective spouses, regardless of where they reside), and/or persons living in the same households as these persons (whether or not related thereto) are not eligible to enter or win the Sweepstakes. TO ENTER: To enter the Sweepstakes, during the Sweepstakes Period, visit https://app.viralsweep.com/sweeps/full/3a2808-19397 (the “Website”) and follow the provided instructions to complete and thereafter submit the entry form, which includes your full name, address, zip code, telephone number and email address (the “Entry”). All Entries become the property of Sponsors and will not be acknowledged. You may enter once during the Sweepstakes Period. Multiple Entries received from any person beyond this limit will void all such additional Entries. Entries generated by a script, macro, or other automated means or by any means that subverts the entry process will be disqualified. Entries must be received before May 31, 2017 at 11:59 P.M. ET to be eligible for the Sweepstakes. Sponsors’ computer shall be the official timekeeper for all matters related to this Sweepstakes.Entries that are incomplete, garbled, corrupted, or unintelligible for any reason, including, but not limited to, computer or network malfunction or congestion, are void and will not be accepted. In case of a dispute over the identity of an entrant, the authorized account holder of the email address used to enter will be deemed to be the entrant. “Authorized account holder” is defined as the person who is assigned to an email address by an Internet access provider, online service provider or other organization that is responsible for assigning email addresses for the domain associated with the submitted email address. Entry constitutes permission (except where prohibited by law) to use entrant’s name, city, state, likeness, image, and/or voice for purposes of advertising, promotion, and publicity in any and all media now or hereafter known, throughout the world in perpetuity, without additional compensation, notification, permission, or approval. WINNER SELECTION AND NOTIFICATION: On or about June 2, 2017, ten (10) potential winners (“Winner”) will be selected in a random drawing by representatives of Sponsors from all eligible Entries received during the Sweepstakes Period. Sponsors will make two (2) attempts to notify potential Winner at the telephone number and/or email address submitted at the time of entry. Sponsors may share potential Winner’s name and contact information with Sweepstakes Entities and/or any prize provider, as applicable, if necessary. PotentialWinner may be required to execute and return an affidavit of eligibility, release of liability, and, except where prohibited, publicity release (collectively, “Sweepstakes Documents”) within two (2) days of such notification. Noncompliance within this time period will result in disqualification, and, at Sponsors’ sole discretion an alternate potential Winner may be selected from the remaining eligible Entries. If potential Winner cannot be reached, is found to be ineligible, cannot or does not comply with these Official Rules, or if Prize (as defined below) or prize notification is returned as undeliverable, potential Winner will be disqualified and time permitting, at Sponsors’ sole discretion, an alternate potential Winner may be selected from the remaining eligible Entries. All details of Prize will be determined by Sponsors and Prize Provider in their sole discretion. Sponsors and Prize Provider reserve the right to substitute Prize (or portion thereof) with a similar prize (or prize element) of comparable or greater value. All taxes and other expenses, costs, or fees associated with the acceptance and/or use of Prize are the sole responsibility of Winner. Prize cannot be transferred by Winner or redeemed for cash and is valid only for the items detailed above, with no substitution of Prize by Winner. If Prize is unclaimed within a reasonable time after notification from Sponsors, as determined by Sponsors in their sole discretion, it will be forfeited, and time permitting, an alternate Winner may be selected from the remaining eligible Entries at Sponsors’ sole discretion. CONDITIONS: By entering the Sweepstakes, each entrant agrees for entrant and for entrant’s heirs, executors, and administrators (a) to release and hold harmless Sweepstakes Entities and each of their respective officers, directors, and employees (collectively, “Released Parties”) from any liability, illness, injury, death, loss, litigation, or damage that may occur, directly or indirectly, whether caused by negligence or not, from such entrant’s participation in the or Sweepstakes and/or his/her acceptance, possession, use, or misuse of Prize or any portion thereof (including any travel related thereto); (b) to indemnify Released Parties from any and all liability resulting or arising from the Sweepstakes and to hereby acknowledge that Released Parties have neither made nor are in any manner responsible or liable for any warranty, representation, or guarantee, express or implied, in fact or in law, relative to Prize, including express warranties provided exclusively by prize supplier that are sent along with Prize; (c) if selected as a Winner, to the posting of such entrant’s name on the Website and the use by Released Parties of such name, voice, image, and/or likeness for publicity, promotional, and advertising purposes in any and all media now or hereafter known, throughout the world in perpetuity, without additional compensation, notification, permission, or approval, and, upon request, to the giving of consent, in writing, to such use; and (d) to be bound by these Official Rules and to waive any right to claim any ambiguity or error therein or in the Sweepstakes itself, and to be bound by all decisions of the Sponsors, which are binding and final.Failure to comply with these conditions may result in disqualification from the Sweepstakes at Sponsors’ sole discretion. WINNER SELECTION AND NOTIFICATIONS: Winners will be selected by Random Selection under the supervision of the Administrator. • All potential Weekly Winners will be notified by Email. Potential Winners will be selected and thereafter notified on or about the 2nd day following the closing of that week’s giveaway. If a potential Winner is determined by Sponsor or Administrator to be ineligible to participate in this Giveaway, declines the prize, or does not respond to Sponsor’s correspondence within 48 hours from time of contact for any reason, the potential Weekly Winner will be disqualified, forfeiting prize without compensation of any kind, and a new potential Weekly Winner will be selected by random drawing from among all remaining eligible entries received for the applicable week’s Giveaway. A potential Winner becomes a “Winner” only after verification of eligibility by Administrator.• The potential Winner will be selected by random drawing on or about June 2, 2017 and contacted via email. The potential Prize Winner will be required to complete an Affidavit of Eligibility, a Liability Release and Publicity Release (where legal) in accordance with the instructions listed in the notification correspondence. acceptance and use not specified herein as being provided, are the sole responsibility of the applicable Winner. A 1099 tax form (preceded by a W9 Form) will be issued to the Prize Winner reflecting the value of Prize or the composite value of Grand Prize and Weekly Prize, as applicable.